Blurring the Line Between Predator and Prey. One of the first things to know about horses is that they are prey animals. Simply put, that means that other animals eat them, and their natural instinct and only defense is to flee. Prey animals usually have wide set eyes as an early defense system. Humans are predators, like mountain lions and wolves. Our eyes are set close and we usually eat meat and wear animal skin. Prey animals tend to have especially sharp senses. Horses are very far-sighted, with a great senses of smell and hearing. Humans are the equivalent of blind, hairless mice in comparison. Instead, humans were gifted with a sixth sense of existential awareness. In other words, we can think. I’m not sure it was a good trade. Self-awareness can be very positive, but it also runs wild with ego and self-importance. To say equines and humans don’t think alike is an understatement. Still, science continues to prove that other species aren’t as limited as we originally thought. The circle of life is more multi-dimensional and interdependent than that. We are arrogant (part of our gift) to think that humans are the pinnacle of evolution. Sometimes the line between predator and prey gets a bit blurred: mice get eaten by cats, who get eaten by coyotes. Beyond that, we each choose to identify differently. Humans may be born predators, but some become prey soon after. Lots of us came to horses because of rough handling as children. We learned firsthand that violent dominance can’t build trust, and we escaped to the barn. Horses were a safe haven where we spoke the language we didn’t hear in our homes. Donkeys seem to blur that same line differently. They are prey animals like horses, but so brave. They protect property, defend their friends, and historically miners and trappers credited their donkeys for their very survival. 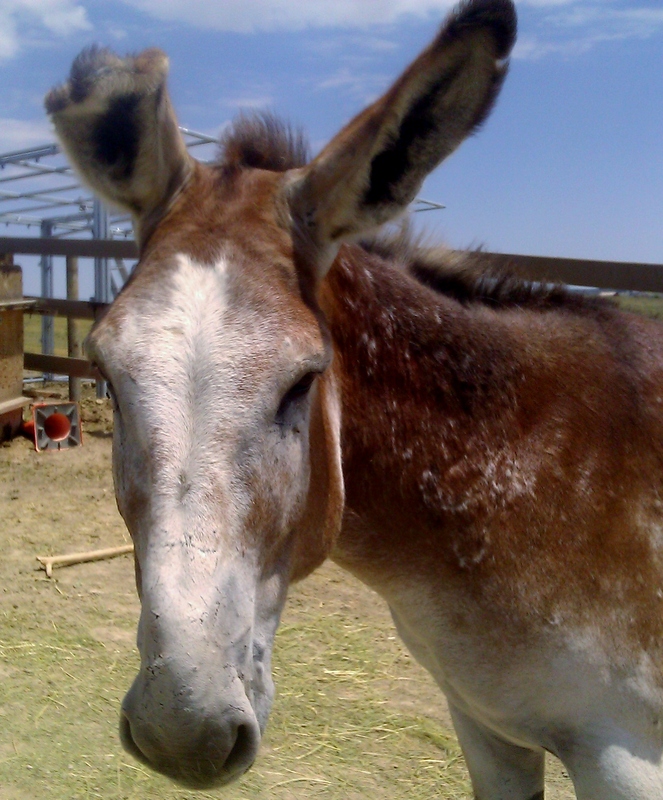 This week’s photo is of Wyatt, a client’s rescue donkey. He didn’t get his scars saving anyone. Wyatt was used in donkey roping. Predators riding horses use electric prods to make the donkeys run and then chase them with ropes. Wyatt has visible scars all over his face and neck, his hind is damaged, and one of his fine long ears has been crushed permanently. He survived, and so does the memory. But those experiences don’t define him as prey. Wyatt is cautious, but he has the courage to reach out to humans again. His quiet wisdom says that life goes on. Eating lunch with a friend in the sun is good enough. When I work with animals like Wyatt, I want to apologize for being born a predator. Between compassion and cruelty, it can be hard to tell who is doing the healing, and who is more evolved. With our gift of awareness, we also get to feel shame. It’s hard to want to identify with a predatory species like humans, in the light of the recent news. Last week there was a horrific shooting spree here in Colorado, leaving too many innocents dead and many more wounded. As humans continue to converse about assault rifles, Wyatt wants the survivors and mourners to know there is a good life to be had beyond this fresh wound. Scars will remain, but our identity does not need to be altered by the acts of predators. My heart goes out to those suffering loss from human cruelty here in Colorado and around the world. I wish them the comfort in their sadness and in due time, the courage to rebuild their hearts and lives. Compassion is a trait not limited to humans. Our domestic animals are most certainly aware when a family member is in pain and many are working overtime just now. With the help of a soft dog nuzzle or the warm breath of a horse, a human can take a moment to breathe. There is a reason animal therapy is so successful. This weekend at Infinity Farm, we are having a clinic working on fine tuning positive communication skills into kind leadership that doesn’t involve intimidation. The clinic benefits Ruby Ranch Horse Rescue and the goal of evolving past the limiting labels of predator and prey, to a more evolved horse/human partnership. Thank you again, Anna, for a wonderful post. I’ll never understand how humans can be so cruel to innocent animals, or to one another. I’m so glad Wyatt was rescued and has a safe home now. Anna, you have said it all so well. . . . Best wishes to you all. I find as I age (yes, even me!) what I used to see as absolutes are not so much any more. The idea of MAN as the superior being, of animals as no more than property dims and I begin to question so much. I’m not a vegetarian, I undertand the need to be “rough” when working with animals in the field. I do NOT see the value or purpose in entertainment abuse. Roping, bullfighting, any of that. And why rope a donkey, other than the need of an inferior to establish superiority?